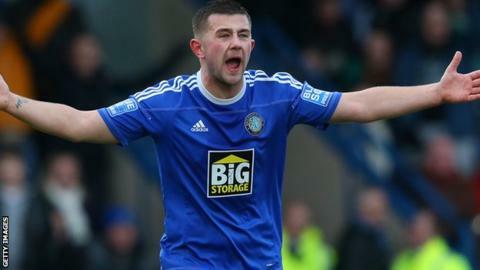 Macclesfield moved into the play-off places as a goal in each half gave them victory over Alfreton Town and extended their unbeaten run to eight games. Danny Whitaker fired wide before Scott Barrow put Macclesfield ahead as he beat three Alfreton players to score. Karl Hawley's low shot was well saved by Rhys Taylor at the other end. Matthew Barnes-Homer twice went close for the hosts, before Waide Fairhurst secured the win when he reacted first to a loose ball in the box. Match ends, Macclesfield Town 2, Alfreton Town 0. Second Half ends, Macclesfield Town 2, Alfreton Town 0. Danny Bradley (Alfreton Town) is shown the yellow card for a bad foul. Foul by Danny Bradley (Alfreton Town). Adriano Moke (Macclesfield Town) wins a free kick. Goal! Macclesfield Town 2, Alfreton Town 0. Waide Fairhurst (Macclesfield Town) right footed shot from a difficult angle on the left to the bottom right corner. Paul Clayton (Alfreton Town) wins a free kick. Attempt missed. Danny Bradley (Alfreton Town) right footed shot from outside the box is too high. Foul by Clifford Byrne (Alfreton Town). Substitution, Alfreton Town. Nathan Hicks replaces Jordan Keane. Tom Davies (Alfreton Town) is shown the yellow card for a bad foul. Foul by Tom Davies (Alfreton Town). Waide Fairhurst (Macclesfield Town) wins a free kick. Substitution, Alfreton Town. Paul Clayton replaces Carl Lamb. Attempt missed. Danny Whitaker (Macclesfield Town) right footed shot from outside the box is too high. Hand ball by Anthony Howell (Alfreton Town). Attempt missed. Matthew Barnes-Homer (Macclesfield Town) right footed shot from the right side of the box is too high. Liam Hogan (Macclesfield Town) is shown the yellow card for a bad foul. Tom Shaw (Alfreton Town) wins a free kick. Attempt missed. Matthew Barnes-Homer (Macclesfield Town) right footed shot from the right side of the box. Attempt missed. Chris Holroyd (Macclesfield Town) left footed shot from outside the box misses to the left. Jordan Keane (Alfreton Town) wins a free kick. Bradley Wood (Alfreton Town) is shown the yellow card for a bad foul. Foul by Bradley Wood (Alfreton Town). Substitution, Macclesfield Town. Alex Grant replaces Andy Halls because of an injury. Carl Lamb (Alfreton Town) wins a free kick. Foul by Tom Shaw (Alfreton Town).